+37.73% Profit Made since June 1, 2014 in the Plain Forex Trade Copier Real Account. +$538 Profit in 3 months for the account size of $1,426. As the name implies, Plain Forex Trade Copier copies our EXACT TRADES into your MT4 account… The Second Those Trades Are Made. If you were a member of Plain Forex Trading on June 1st, these exact trades would’ve been copied into your account. 1) Our software copies the trades we make, directly into your MT4 trading account – including stop-loss orders and profit targets. 2) We explain every trade we’re making, so you can see WHY a trade makes money, as you actually make real money on the trade. 3) Each trade is managed throughout the day, to ensure maximum profitability. 4) At the end of each day, we send you a detailed account of what trades were made or adjusted, and WHY, so you learn on the fly what makes a trade profitable (while earning the same profits we do). 5) We stand behind our customers – after ordering, you can shoot us any questions you have and we’ll answer them! 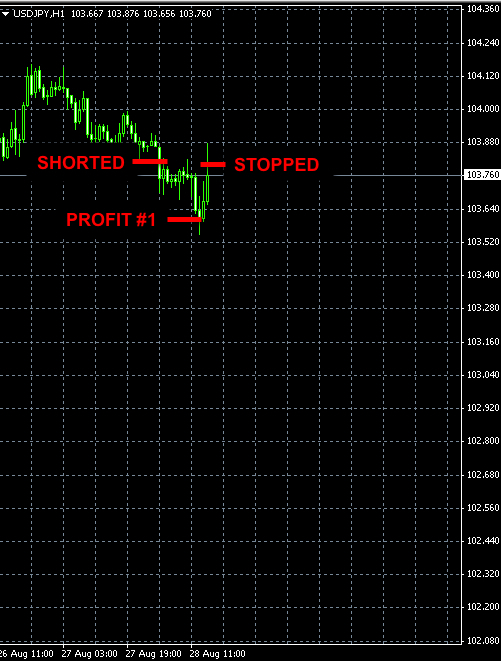 The total trading result for this week is +36 pips of profit. Trading (finance) Why is low volatility in the forex markets bad for traders? Traders make money on price moves. They either buy low and sell high or sell high and buy low in the case of short selling. If there is no price move there is no money to be made. As simple as that. The direction of the move is not important but it’s imperative that there is a meaningful price move. Since no one can predict on a regular basis when the price is going to change, traders can capture only some part of the move. Therefore the move has to be wide enough for a trader to recognize the move, open a position and make a reasonable profit on that position before the direction of the move changes. Trading non-volatile choppy markets is very difficult and requires a lot of patience and strict money management. Our short USDJPY trade opened yesterday has reached its first profit target this morning for the profit of +19 pips (see the previous post). We are still holding 2 more units with stop-loss orders set at the break even price of 103.79. Wd., Aug. 27. 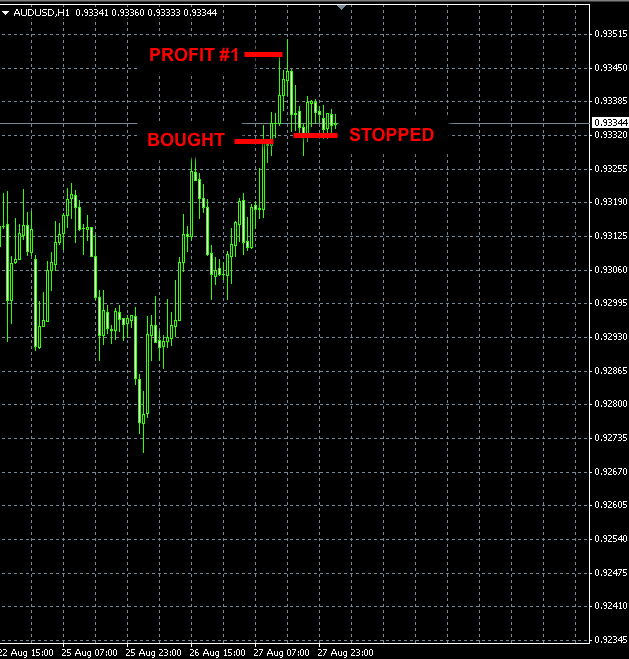 AUDUSD Long Trade Result: +17 pips realized profit + 2 units still open. Can I make a living off trading online? Contrary to what many people believe, almost anyone can make a living off trading online. But only after they master the trading psychology and achieve necessary levels of knowledge, skills, discipline and funds. Lacking in any of the things above will lead to failure. Mo., Aug. 26. No signals triggered. Our AUDUSD buy signal was not triggered on Monday. Fr., Aug. 22. All orders cancelled – heading into the weekend. There are two important news events today: Fed Chair Yellen and ECB President Draghi speeches. Taking into account that today is Friday and judging from the knee jerk reaction on CAD news, I prefer to stay away from trading today.